Continuing to head West, I left Fargo on HW 10 which ran about 1 km parallel to the interstate (I94) and next to a railway line. I enjoy watching all the very long trains come past. The 10 took me through some smaller towns on what was a very nice sunny day. Parts of the road were gravel. 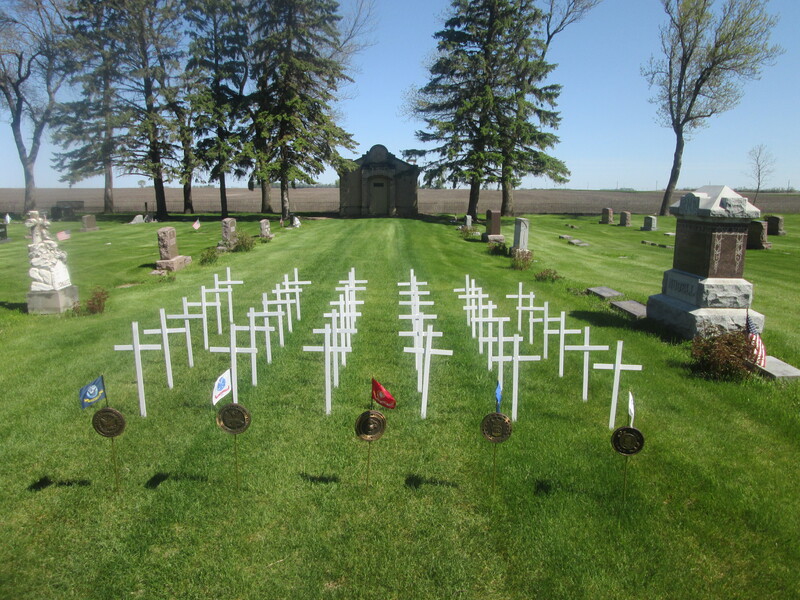 A lot of the towns are getting ready for the Memorial Day holiday, to remember the fallen soldiers. At Tower City (again far from a city) the 10 ran out and the best option was to get on the interstate for a few hours. At about 2 p.m. I pulled off the I94 to visit Valley City. I stopped to check the fighter jet in the park and was looking around for somewhere to eat when I guy came up to me and asked if I could do a quick interview for the local radio station. The owner of the station Todd had seen me cycling in and had rung Steve the news director to run out and grab me. The station was only 2 minutes away. 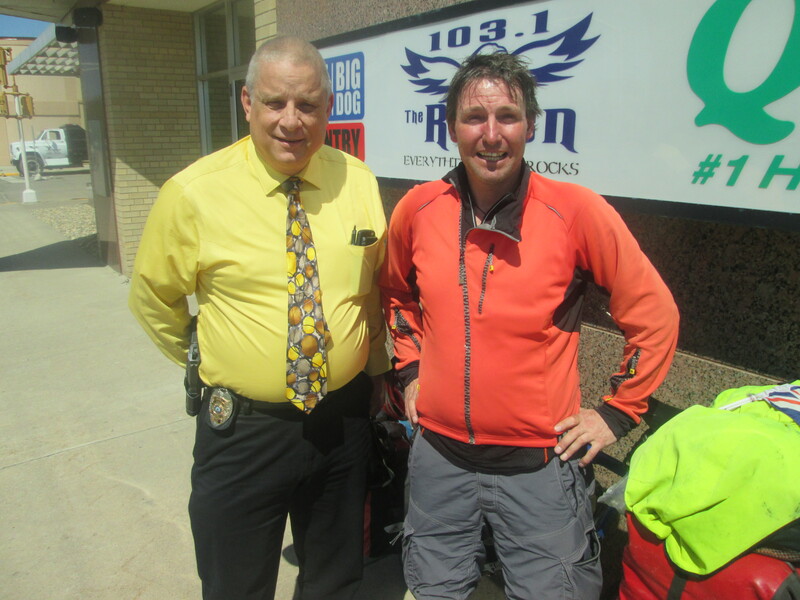 We took a few photos outside the studio and the local Police Chief came over – so I got a photo with him too. We did an off-air interview. But it was then decided we would just do it live and I went into the studio and spoke to Chase for about 15 minutes about my trip. I am really enjoying these radio interviews. They are a lot of fun and I am becoming more at ease after some early butterflies. All the staff at News Dakota were so friendly. The receptionist Joanie arranged for me to visit the local pizzeria for a meal on her. I left News Dakota feeling very humble after some kind donations were made to my Asthma charity (after I left Valley City the staff at the radio station made an even greater and generous donation of $250.00 to my fundraising page.) Then I was completely blown away when Todd, the owner came back and said he would arrange for somewhere for me to stay tonight. 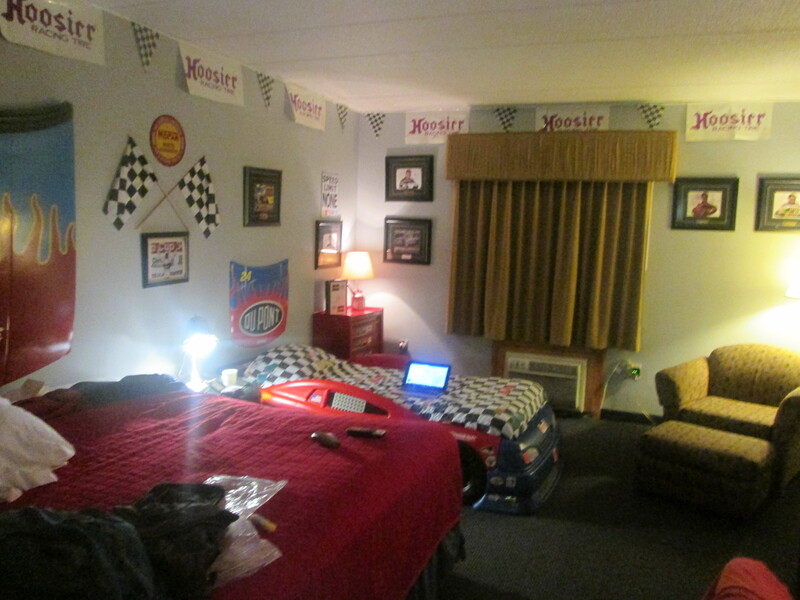 I never thought I would be staying in a hotel while travelling America. Todd said if I could cycle 50 km to the next town, there would be a room and tomorrow’s breakfast for me at the Gladstone Inn and Suites. It was definitely a good incentive and I was easily motivated to knock out another 50 km. Along the way I crossed the continental divide. I got to the Gladstone at 8 p.m. and had plenty of time for the swimming pool and hot tub. I was pretty tired after a 150 km day…………but I still stayed up to 1 a.m. watching TV since it was the opportunity to watch some TV for a change. I was in no hurry this morning. I had a sleep in – another shower and a leisurely breakfast consisting of pancakes, bacon, sausage, eggs and Hash browns. Check-out was 11 a.m. and I didn’t leave a minute sooner. I then chilled out in reception for another hour – just to delay my departure. So half the day was gone before I got the wheels rolling. They were rolling well because I thought I would only do about 70 km and had a town lined up and within 3 ½ hours I was there – giving me the rest of the day to chill out. Coming out of the supermarket I met a guy who said he had heard me on the radio and kindly gave me a few dollars. 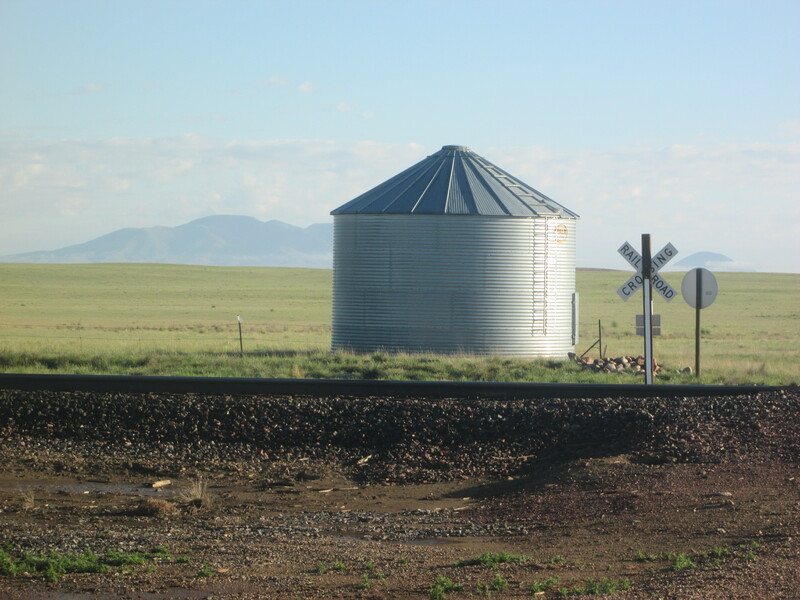 It is so flat out here you always know when you are getting close to a town because you can always see the town’s water tower, sometimes from as far out as 10km. The next thing you can tell is the size of the town by the size of the tower. I went off the 52 a couple of times to cycle through a few small towns to find a picnic area for lunch. They were deserted. Everything was shut and no-one around. 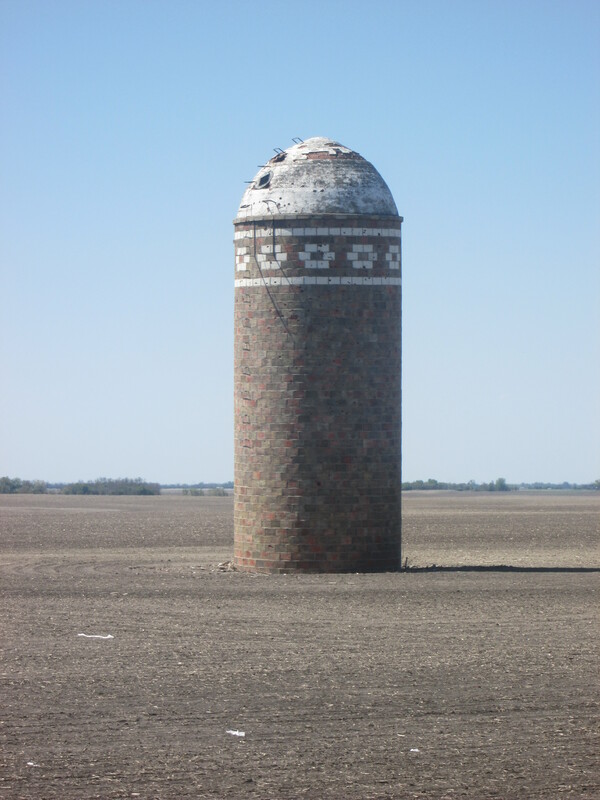 I have been told that in North Dakota there are some missile silos amongst the fields. Some have been decommissioned. Some are still very active. I have been looking and haven’t seen either. I picked up another puncture this morning, making it two so far for the trip. It is always the way. I was all ready to go this morning when I discovered I had another flat tyre. Changed the tube and that didn’t’ last too long either because when I got to Minot 100 km later, I had another flat tyre. At least the weather has been kind to me. The scenery has been very nice and there are also lots of interesting things to see along the way. I have another “Warm Showers“ host lined up in Minot. I decided to take some back roads to avoid the highway for a bit. I ended up cycling on gravel for about 20 km. But it was nice cycling through the countryside. As I got into Stanley it was getting dark. I went to the local community campground. But you had to pay so I went across the road to the local park which was next to the Court House. I got to the covered picnic area just in the nick of time, the sky opened up and it started to pour. I was glad I could cook my dinner out of the rain. I ended up setting my tent up under cover as well. I was making the most of the free WIFI outside the Library when I met a guy called Josh. He is travelling around in his van and collection of bikes. I joined him for breakfast. 30 km later he passed me on the highway and stopped and gave me a bunch of energy bars. 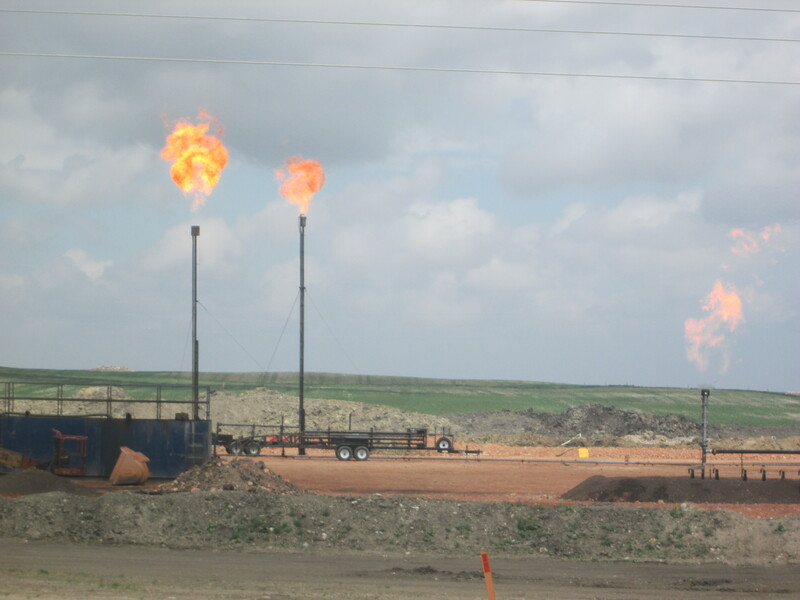 Oil and Gas is what keeps the state of North Dakota going. Today I really knew I was on the oil patch. The fields were filled with a scattering of oil wells all along the highway. There were big, big drilling rigs as well and lots of industrial traffic. All along the road were compounds related to oil. Some of the compounds were massive complexes of prefab design to house the workers. Just as I was entering Williston I caught up with Josh again. He offered to show me where the city parks were and a possible place to camp. The first option was a big park with a lake outside of town. In town the two parks we saw were real city parks and quite busy and close to big roads. Josh left me in town and it was proving difficult to find a place to put the tent up in a biggish town of 40,000. In the park, they had nasty signs stating No Camping and violators will be prosecuted. It was a bit open and nowhere to really hide. I didn’t want to push my luck. It doesn’t get dark till 9:30 p.m. and I am not keen on waiting that long before putting the tent up under the cover of darkness. So I cooked my dinner in the park before finding a little spot at the back of the Baseball Diamond. They were playing a game. No one took any real notice of what I was doing. Freezing, freezing cold this morning, so I packed up and spent 3 hours in McDonalds. On the way out of town I called in for a $10 haircut, after some negotiation. The Barber was a bit crazy. Talked about smoking Cane Toads, was pretty Racist and ignorant as well. 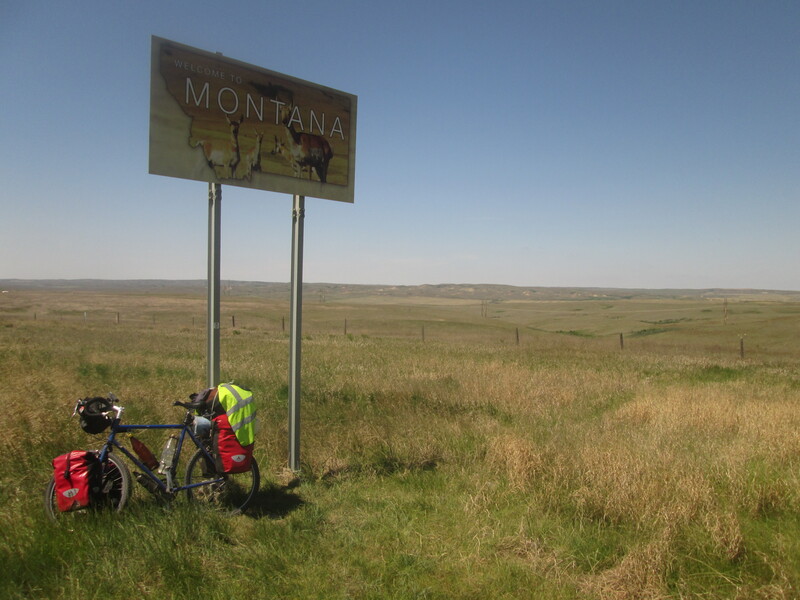 After 37 km I crossed over the border into Montana. The landscape seemed to change straight away. The highway went from 4 lanes to two and the traffic dropped right off. The light was really good for taking photos. Called in to the local history museum on the way in and for a small donation, had a look around. There was free camping in the local park. 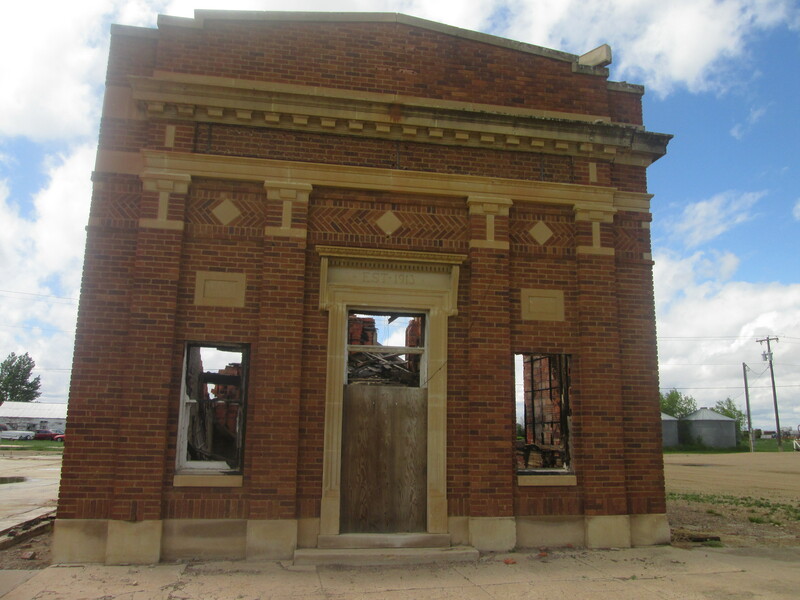 Culbertson is just a small farming town of 900 people. One good thing was the camping in the community campground was free. Like most nights I had the park to myself. It was a lovely evening to relax while cooking dinner with the sun shining bright. Another cold, cold start to the day. 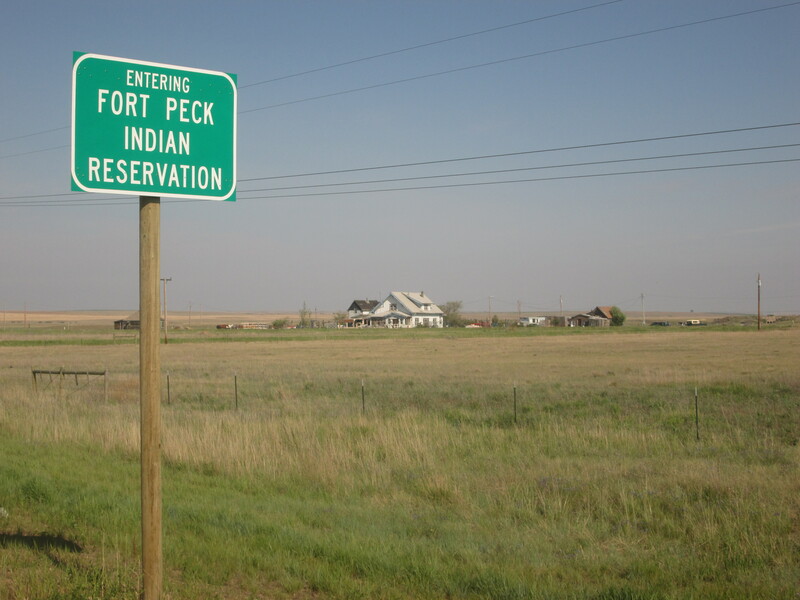 Only cycled about 10 km before entering the Fort Peck Indian Reservation. The first town I went through was Brockton………….I’m glad I stopped early yesterday evening because I had planned to stay here last night and looking at it now it was not very inviting. Along the road are billboards for anti-drugs and alcohol or Casinos. 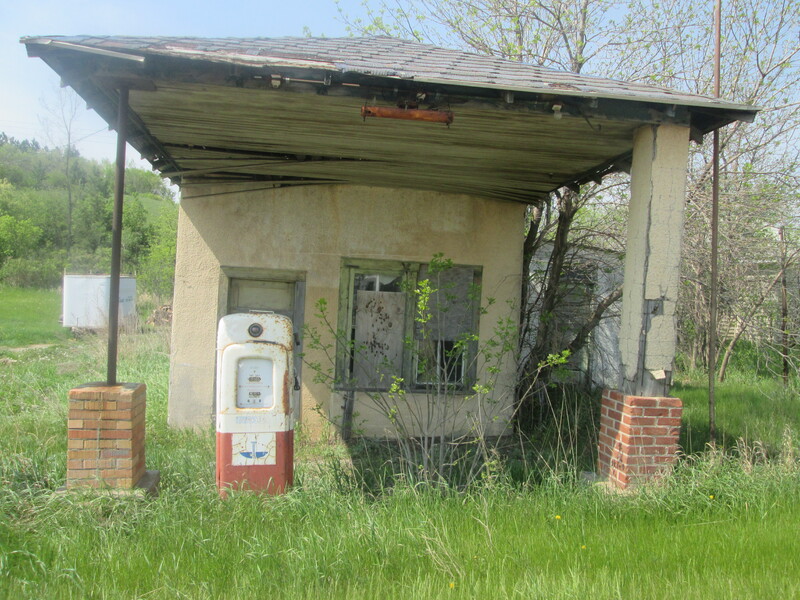 There must have been a boom because now some of these casinos, restaurants and gas stations are all boarded up. The second town I cycled through was Popular which was bigger than the previous town. But still not much in the way of shops. On the way in I caught up with a cyclist I had been following for about 10 km. Kenny Smoko was a local Indian doing a bit of rehab after knee surgery. He told me to call him if I got in any trouble. Kenny is a health administrator looking after clinics on the reservation. I nearly ran over this snake on the hard shoulder. It has already been pointed out to me that perhaps it had already been run over. Cycling on I got to Wolf Point which is the largest town on the reservation. It had a McDonalds and a supermarket but not much else. I was happy to get out of Wolf Point. I cycled 22 km before I was conscious of the fact that it was possibly going to rain. Was on the look-out for a good camping spot. It is all very open out here and fenced so no-where to really hide. I cycled past a lake and then decided to go back and take a closer look. Thought there could be a good spot to hide. There was no gate so I could go straight in. The track went down then up over a bank and down again. I was able to camp in the hollow so I was at least partially hidden from the road. It was nice being next to the lake. Lots of cool birds flying around. Had some heavy rain overnight but slept pretty well on the reservation. 2 km up the road I turned off the highway to cycle through Frazer. It was one of those towns that I very quickly thought I shouldn’t be here. Every house I cycled past had a yard full of wrecked cars and unkempt lawns. Barking dogs were running out at me from every direction. In one part all the houses were boarded up and some houses you could tell they were occupied but still had some windows boarded up. The only shop in the whole town was a pub. I didn’t dare take any photos in case someone saw me. There wasn’t anything good to photo. 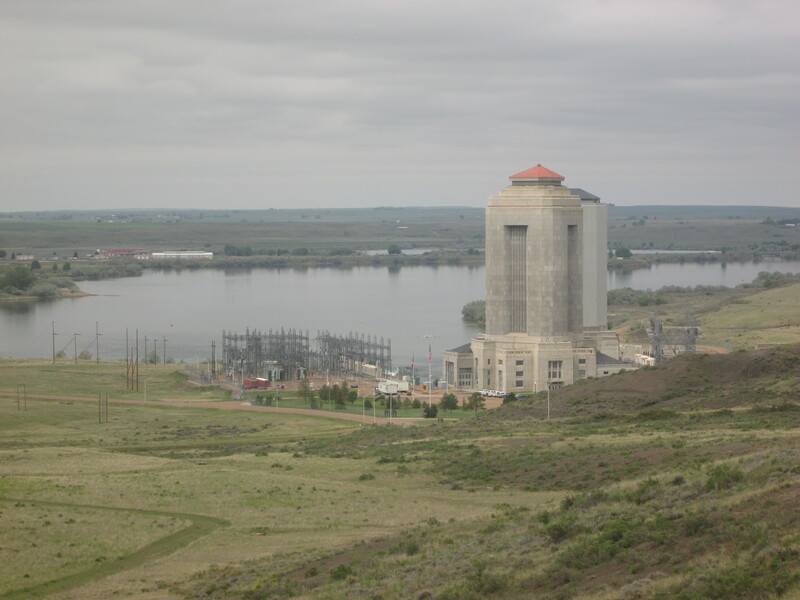 At Nashua I came off the reservation and headed down to Fort Peck Dam. It is the largest dirt dam in the world and holds back the Missouri river. I went on a very good free tour of the Hydro Power Station. We got to touch one of the spinning turbines at the rate of 126 rpm. Spent a few hours at the dam before cycling up to Glasgow and setting up camp in the local park. While I was checking it out, I had a guy come up to me and introduce himself as the Park Director. He said it was no problem camping and suggested a spot. Bit of a late start due to a two-hour breakfast in McDonalds. Good cycling day – warm, sunny and little wind. Hail and storm warning for later in the day. Around mid-morning I ran into two Dutch cyclists heading to Boston – the first I have seen in a long time. I called in to Hinsdale for lunch. I was in the local park and asked a local guy if there was a public toilet. There wasn’t but he said he would open up his wife’s ice-cream shop next door and I could use the bathrooms there. Lonnie and Leona are a lovely couple. They invited me to stay and rest. Filled all my water bottles for me and even gave me a couple of scoops of their most popular ice-cream which was a nice lunchtime treat. In the past two days I have seen at least a dozen dead snakes on the road…………one of them I had the misfortune to accidently run over while I was busy looking at the countryside. With the warm weather it has brought out all the bugs and I was eaten alive. Late in the day I ran into another cyclist heading East. This young guy was American and heading to Maine. Cycling into Malta, I stopped at the Dairy Queen (Fast food) for the internet. Then I cycled on to the local park and where I set up camp for the night. 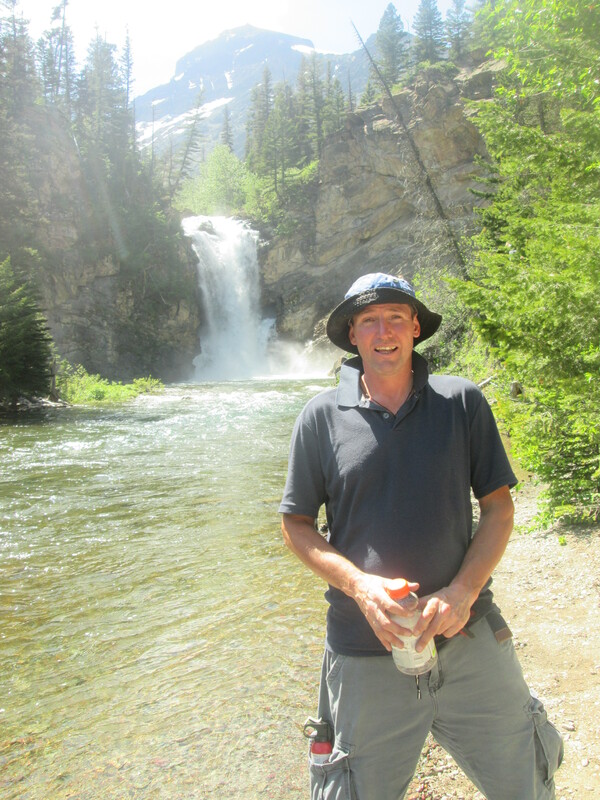 It was a good spot because in was off the main road and away from houses between the showgrounds and the Milk River. In the early hours it started to rain. When it came to getting up, it was still raining quite hard. I packed up in the rain. To make things a bit easier I dragged everything under the picnic shelter to sort everything out and make sure everything was in watertight bags. 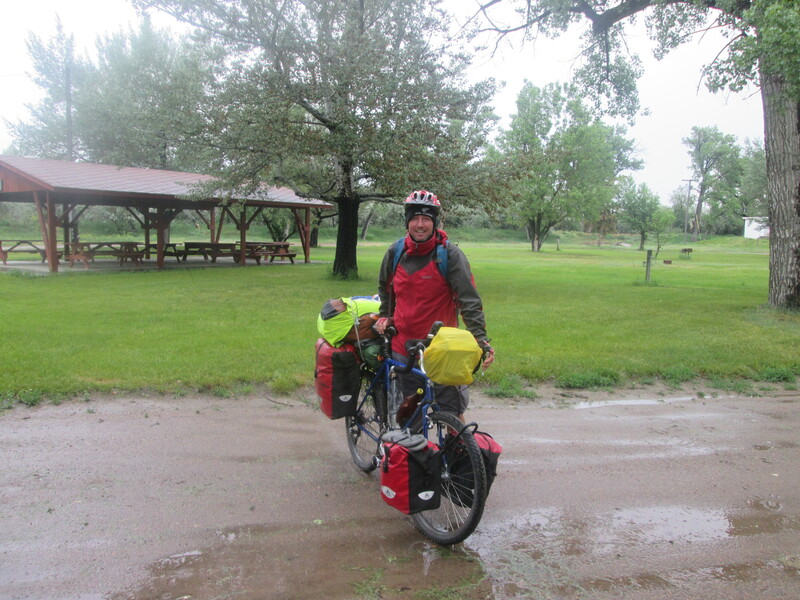 I set off in light rain and cycled 30 km to Dobson which is a town of 100 people and in decline. The main street was scattered with closed shops and bars. There was one shop open……….the shelves were lightly stacked. 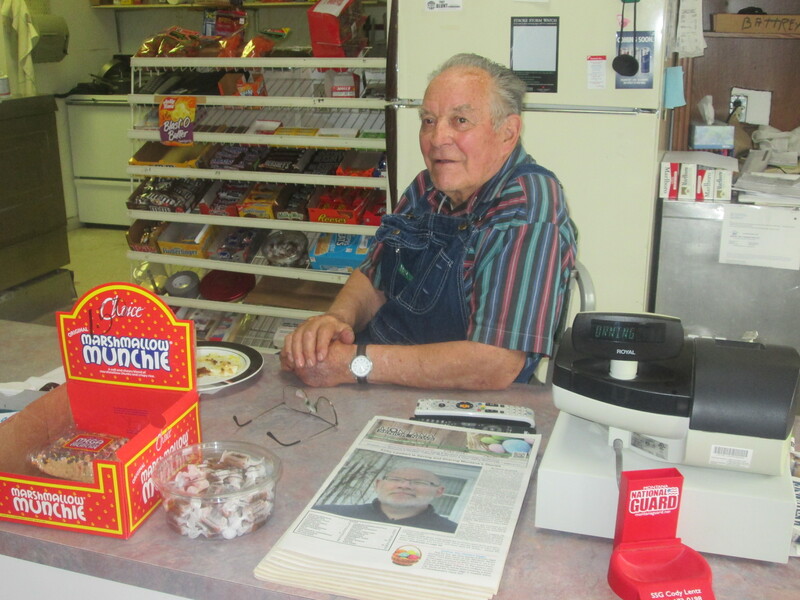 I got out of the rain, stopped and had a coffee with 86 year old Al. He was born in Dobson, had been away for many years and came back. While I was there a Mexican lady came in. Al asked her why he hadn’t seen her for a while; She replied “Jail”. I asked her what for; She laughingly replied “ I beat up my kid” – bit of Mexican loving. Al’s was the last stop before Harlem another 50 km away. 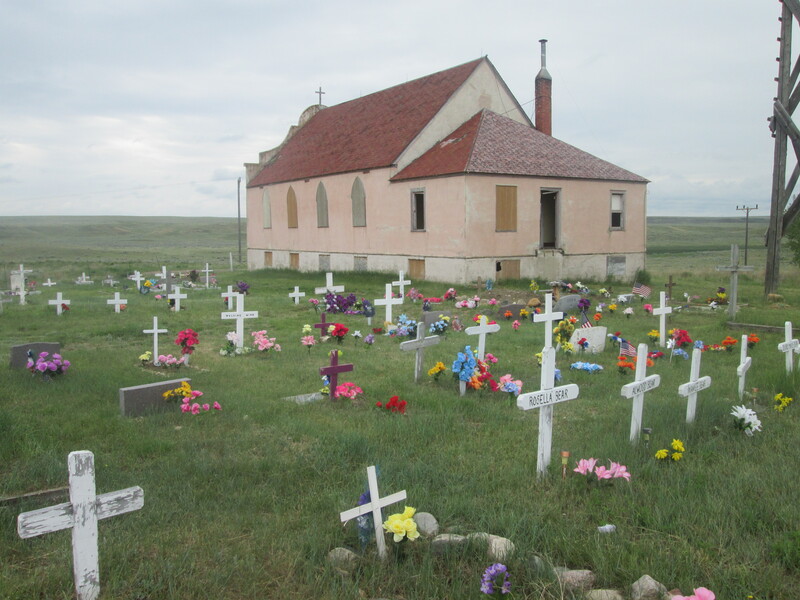 Shortly after Dobson I went on to Fort Belknap Indian Reservation. At least the rain stopped and still no wind, which made it nice to cycle. I came across an old Catholic Church out in the middle of nowhere. It was all boarded up except the back door which had been ripped off. I went in and had a look. It was now the home of the birds and everything was a mess inside. 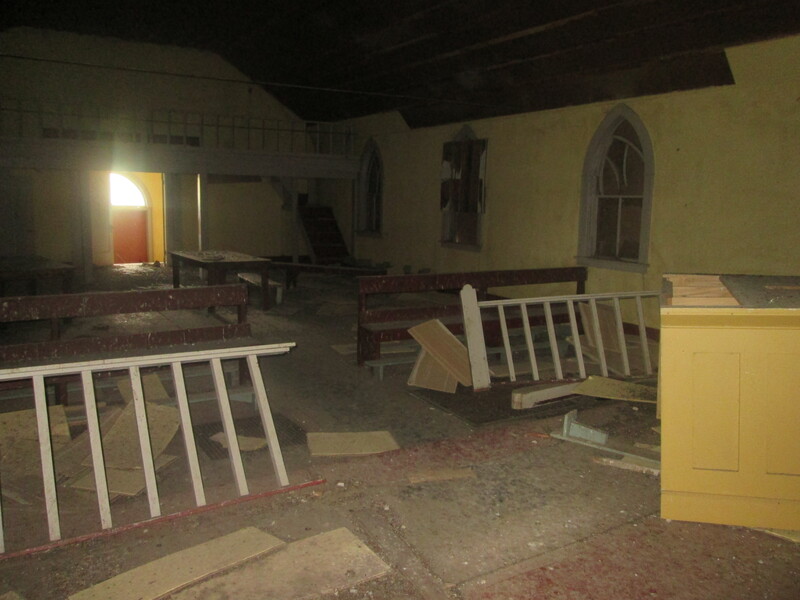 The pews and Altar were still there. Just before leaving the reservation I passed Fort Belknap all it had was a gas station and a Casino. When I reached Harlem I found another declining town where more things were closed then open. The library was closed. But I spoke to some young Indian kids and they were very friendly and asked lots of questions. They hadn’t heard of New Zealand and had less of a clue where it was. Is it close to Florida one asked. They said school was out for the summer and I asked them what they were going to do? One said he was going to visit his dad in Wyoming and another said he had nowhere to go and was staying in Harlem for the summer. I felt a bit sorry for him. They are few and far between in this part of the country but I have managed to find a “Warm Showers” host for tonight. After a week, I finally get to have a proper shower. Most other days I have to settle for the wet wipes. Genevieve kindly cooked me a breakfast before I left in what was a foggy morning. Some days you start cycling and it feels like such an effort to get the bike moving. You wonder if it is because your legs are tired or is it just the road surface. If it is not that – then are the tyres pumped up enough or do I need to oil the chain? Worse – have I got a flat tyre? All these things cross your mind…………in the end it is just the wind. Half-way I stopped in Chinook which is a medium-size town. The local history museum was free so I spent an hour having a good look around. 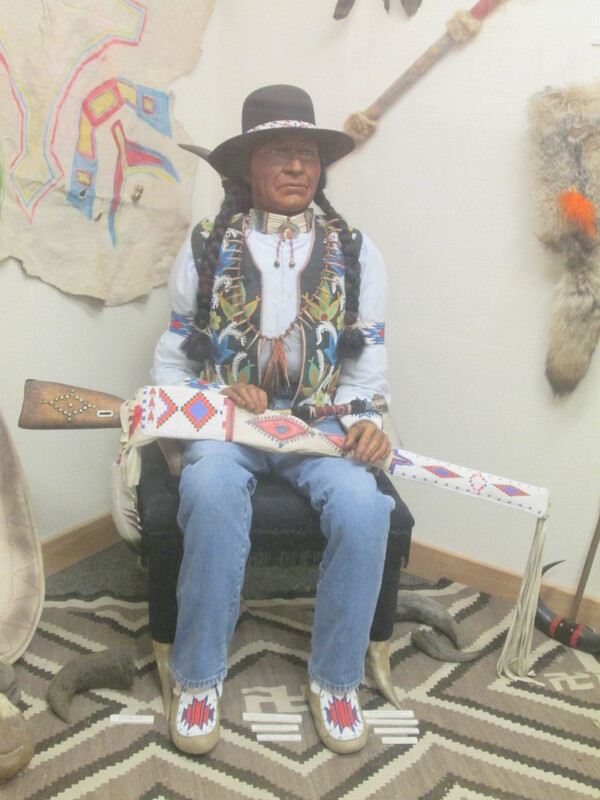 Part of the museum was dedicated to the Indian wars and the battle of Bear Paw Mountains. Afterwards I went into the supermarket to get some lunch. One of the ladies working there said there was a New Zealand woman living near the town, having married a local. 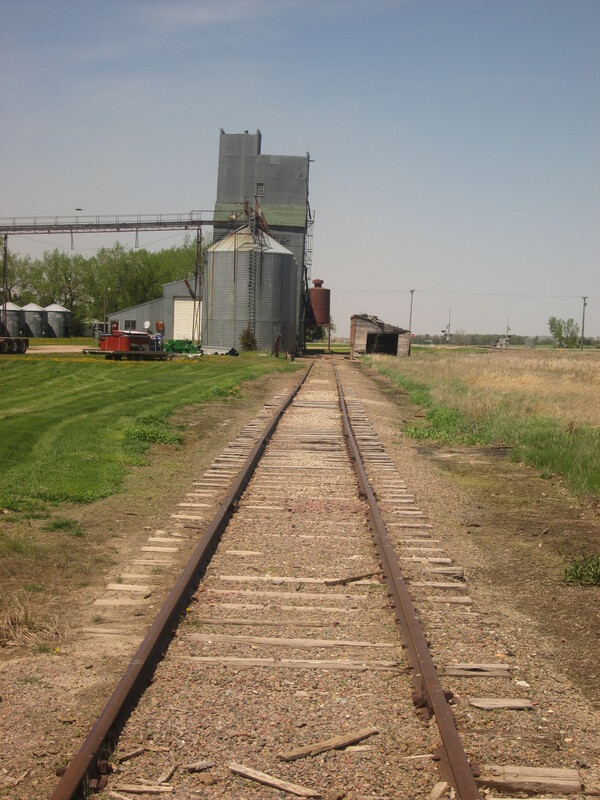 I made good time in getting to Havre which gave me a good part of the afternoon to have a look around town. The railway museum was free. There is another museum below the city which is an underground street that was created when 4 blocks of the town burnt down in 1904. At around 7 p.m. I went and found a spot in the park to camp. The park was pretty busy with lots of families. I cooked up some rice, chilli beans and salami. Afterwards I put up my tent. Again nobody said anything. It had to happen sooner or later. At 2 a.m. this morning a noisy drunk came through the park. He stopped outside my tent and asked me to wake up. Too late for that I was already wake. He then said he wanted to fight me. I didn’t engage him in conversation and was waiting for him to try and open the tent. In less than a minute, having not received a response – he gave up and said see you later. I continued to hear him shouting as he left the park which caused the dogs to start barking. Eventually there was silence again – but I could not get straight back to sleep. The day started with early morning rain. 25 km down the road I got yet another blimming puncture. What a pain, back tyre again meaning I had to take everything off and it was spitting with rain as well. Then 10 km down the road I got another puncture. The hard shoulder is rubbish………..full of so much crap. I’m now riding on the road. OK the last few days I have been going on about all the dead snakes I have seen. Well today that all changed. I stopped to read an historic marker. 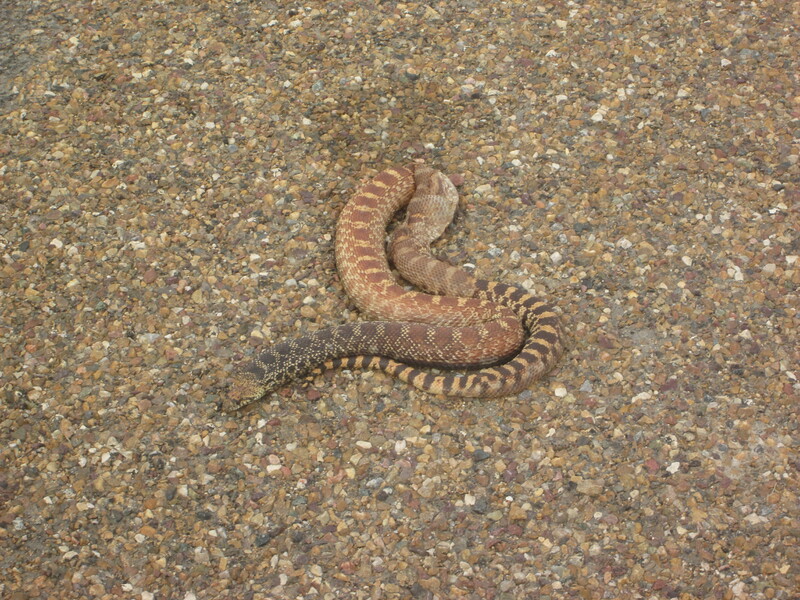 Went to walk around the back of it and came within 1 metre of a Prairie Rattle snake, that wasn’t too happy to see me. It was curled up in the sun, lifted its head and body 200 mm off the ground and with its tongue going at a thousand miles an hour was hissing at me. I went pale as a ghost in sheer fright and turned and walked away shaking – forgive me for not going back to take a photo! Leaving Cut Bank this morning you could see snow on the Rocky Mountains – 80 km away. As the day went on, the mountains got bigger and bigger. Most of the day was spent cycling on the Blackfeet Indian Reservation. The weather is starting to heat up and by midday it was in the high 20s. 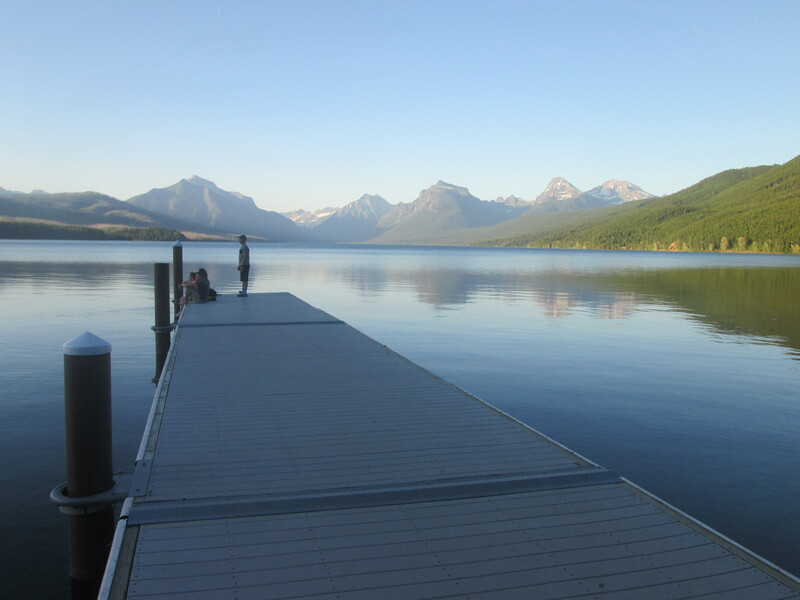 There was only one town between Cut Bank and East Glacier and that was Browning. I stopped here for lunch before pushing on. In East Glacier I had “Warm Showers” hosts Sam and Jo. They had a nice spot in their yard for my tent. Sam is a paramedic and was on call. He also works in the National Park. Jo works from home and works for the library service. They were very easy going hosts. Jo was a great cook and we got to have some really yummy food. After our lovely dinner we all walked over to the fancy lodge for some live music and a look around. It was built over 100 years ago by the railway to encourage tourists. The lodge is made of timber and also has nice views of the snow-capped mountains. My rest day wasn’t entirely a rest day. I spent the hot morning sorting out the bike. Put the new tyres on, repaired a puncture from the other day. Fitted my new blue front panniers. It is sad to see the old red ones go but the current colour choice is Black or Blue. I would have preferred red. 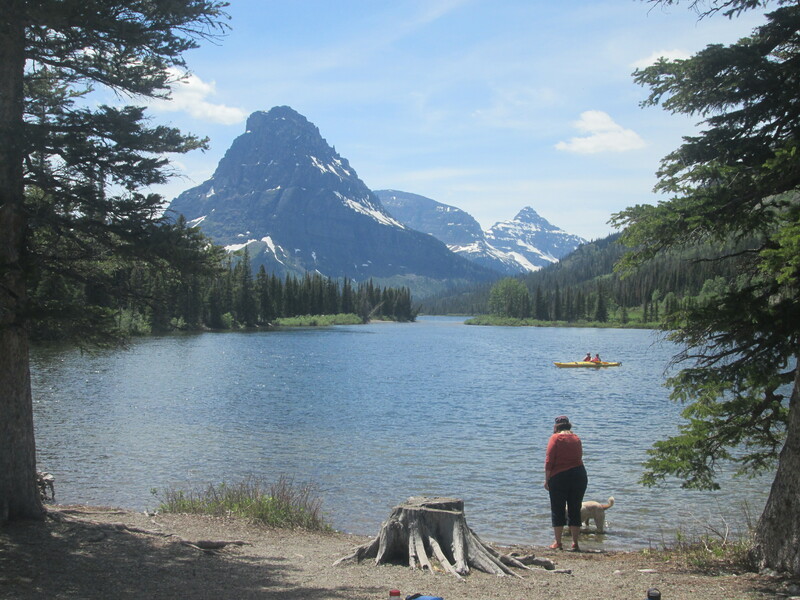 In the afternoon Jo took us for a drive and a small picnic up to Two Medicine Lake which is surrounded by mountains. Afterwards I walked up to see Running Eagle Falls which had plenty of water coming over the top. This morning when I reached the summit of Maria’s Pass, I also crossed the Continental Divide. 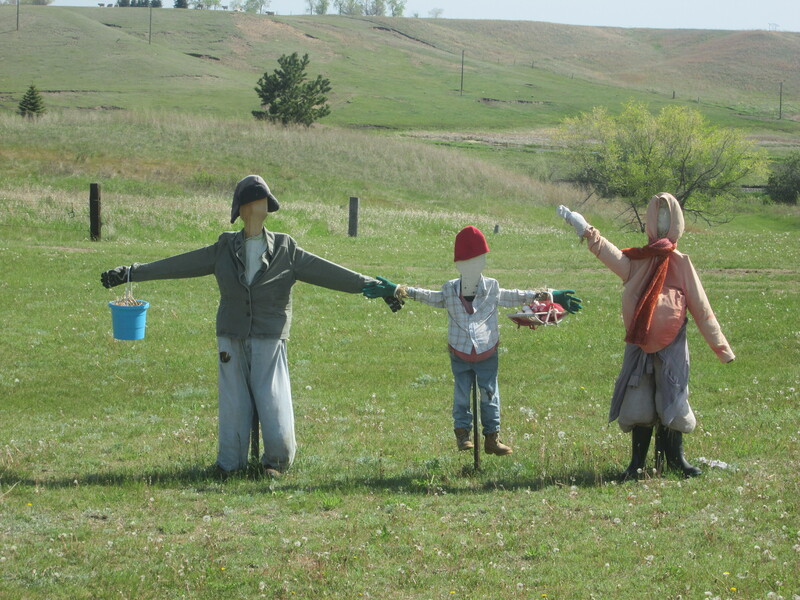 It is a real change of scenery now, with the plains of Montana replaced by steep mountains, forests and winding roads. Before I left East Glacier I made a very important investment with the purchase of some Beer spray. There are about 2500 black bears and 150 Grizzlies in this area. Other predators are Mountain Lions, Bob Cats, Wolves and Coyotes. 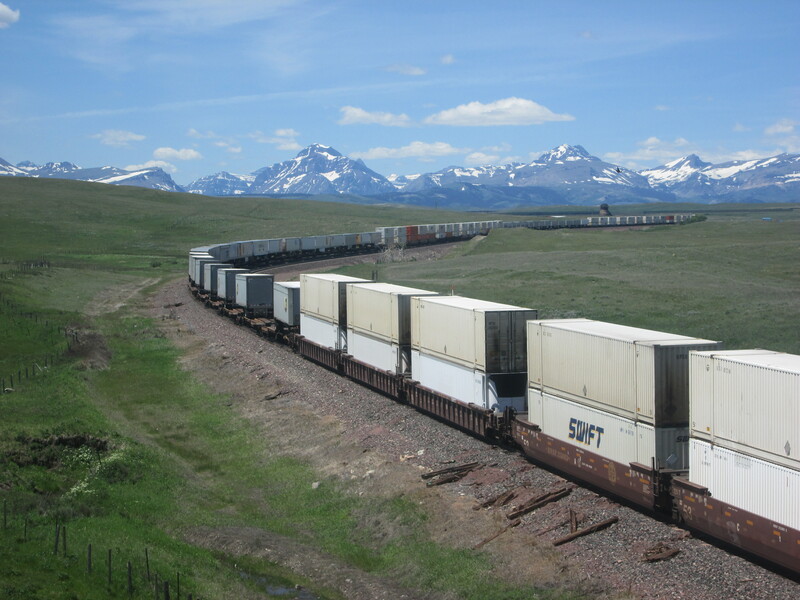 It was a very scenic ride, parallel with the rail track, over to West Glacier. There is a very good programme called Hike and Bike. It means if you are camping in the National park it is only $5 for cyclists instead of $20 if you come without a motor vehicle. So I have paid for two nights. This is the first time in the US I have paid for accommodation. It has been a bit of a challenge to pass the US not paying for accommodation and I am only a few days away of achieving that. But hey I’m not going to free camp outside the park and miss out on this experience. It was absolutely stunning when I cycled in to the park. The road came out of the forest and down to the edge of Lake Mc Donald. At the other end of the lake was rugged snow-capped mountains. I set off at about 8 a.m. for the road to the sun. I got about 30 km to find the road was closed for construction and told to come back at 3:30 p.m. when the road would reopen. 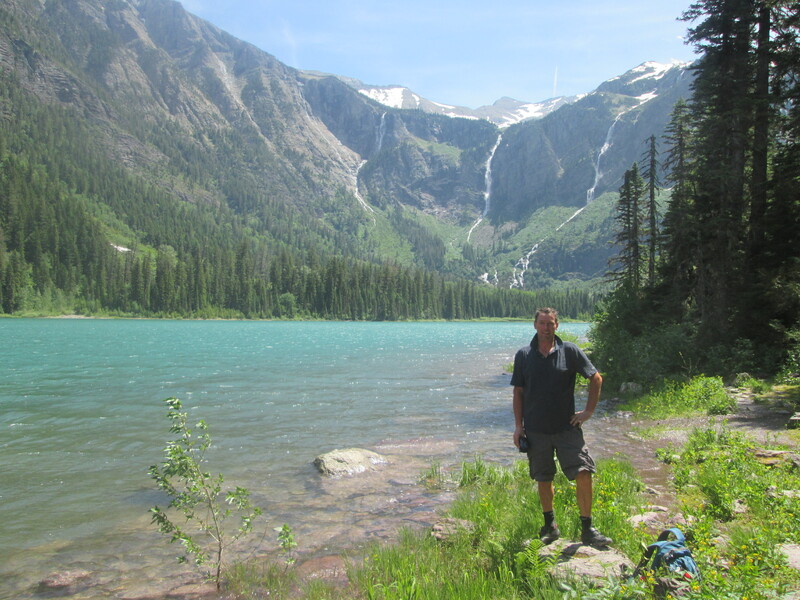 With some time to kill I decided to do a 10 km return hike up to avalanche lake. 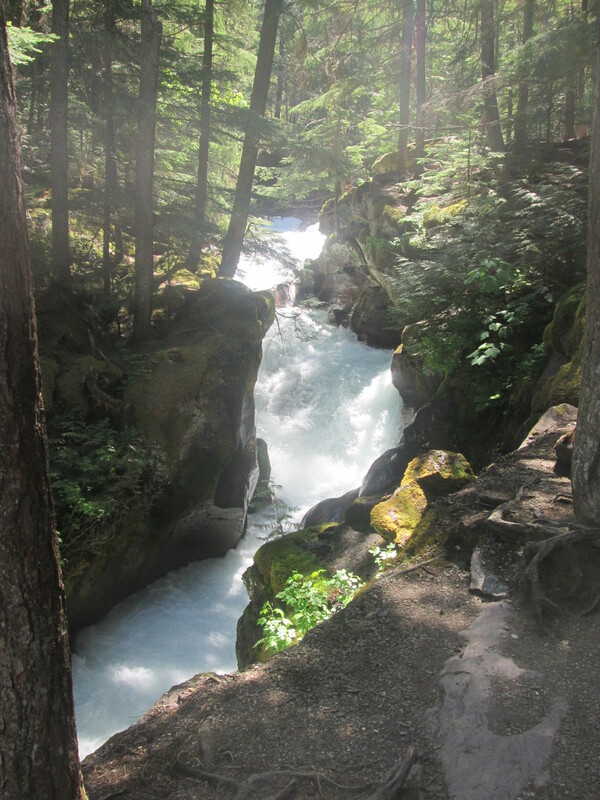 The trail started by following a fast flowing creek with cannons forcing the water through with some ferocity. My bear spray has come out of its packet now. The tree cover gave good respite from the hot sunny day. It was all uphill to the Avalanche but was well worth it. The lake is surrounded by steep mountains with some snow and 5 water falls making their way to the lake. By the time I got back it was time to head back up to the road block. I got back to the road block at 3:30 p.m. It wasn’t until 4:50 p.m. that they finally opened the road to the Sun to bikes only. There was some light traffic with some driver training of the old fashion Park buses. 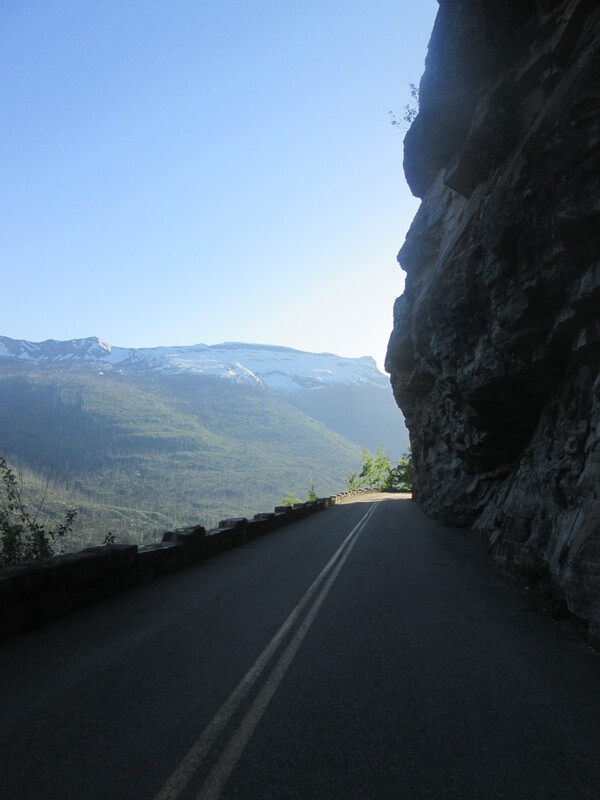 It was great to have the winding road pretty much all to ourselves. There was 10 of us that had waited it out. I ended up cycling with Sonia, a local woman, up to the top of Logan Pass. It took us around two hours. As we climbed it was spectacular scenery with mountains all aroundAnd some with snow. There were some big waterfalls created from the melting snow. I took all my panniers off to cycle up. It wasn’t any easier. 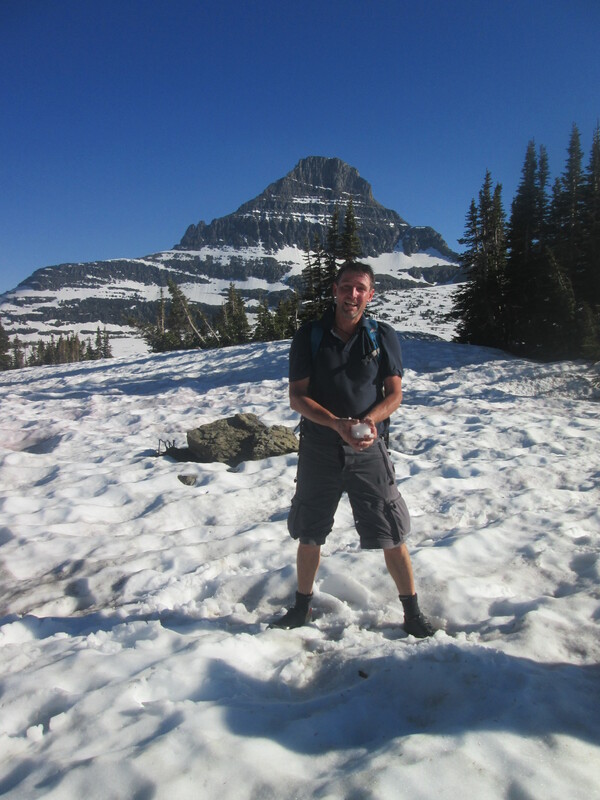 When we reached the summit of Logan pass there was still a lot of snow around. After a little rest it was a bit of a rush to get down. I still had 55 km to get back to the camp site. When I got back down into the valley it was cooler and dark. I cycled down the middle of the road in case any animals came out. It was hard to leave the park this morning after such a good day yesterday. There is still so much to explore. I had a pretty interesting place to sleep tonight: . 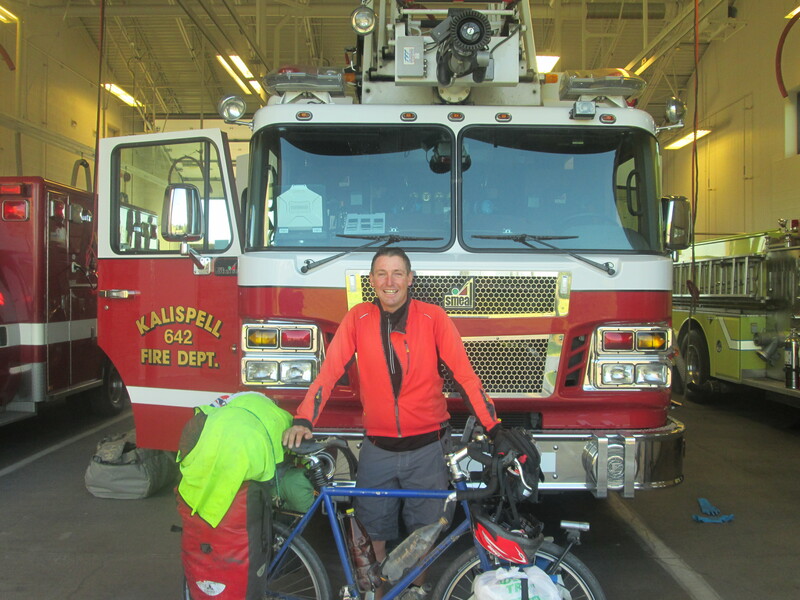 Station 62 of the Kalispell Fire Department. The brother of a friend in London works there and he was on a 2-hour shift, so he said come and stay. Taylor gave me a full tour of the station and a rundown of the fire engine and equipment. As well as the fire engine, the station ran 2 ambulances. It was a big station and only 4 guys to man it. The guys cooked up a great dinner. Then they had a steady number of medical call outs. On two occasions I was the only one left in the station. It was never long before they returned. At 2:30 a.m. the station alarm went off and they had to take the engine out for a fuel spill. The guys went off shift at 7 a.m. and I set off shortly after. I am having a number of easy days before the next big push. Come the weekend I will be in Canada. 2 hours cycling and I was in White Fish. I went to the bike shop and invested in some new pedals. The cheap pair I recently brought in Minot are already done. 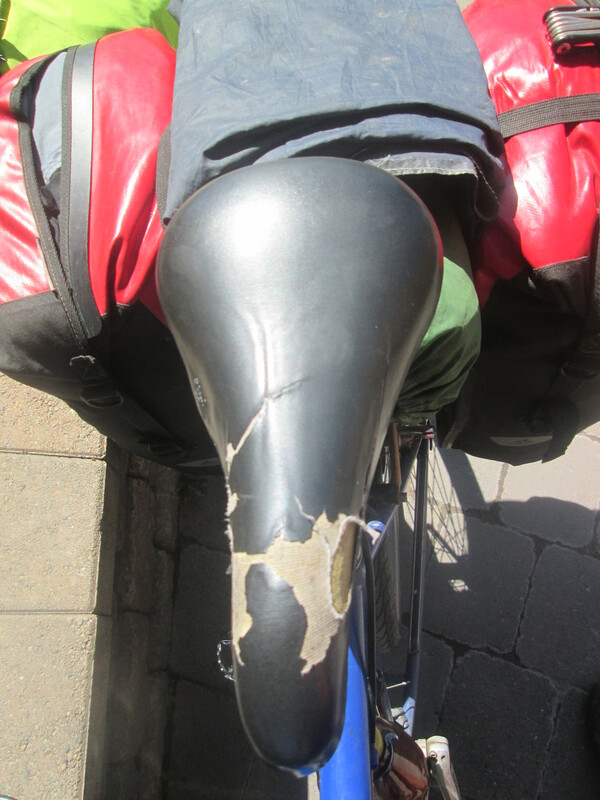 I also replaced my original seat after 40 000km……….sad to see it go. I also brought a new pump to be safe for the more remote parts that are to come. 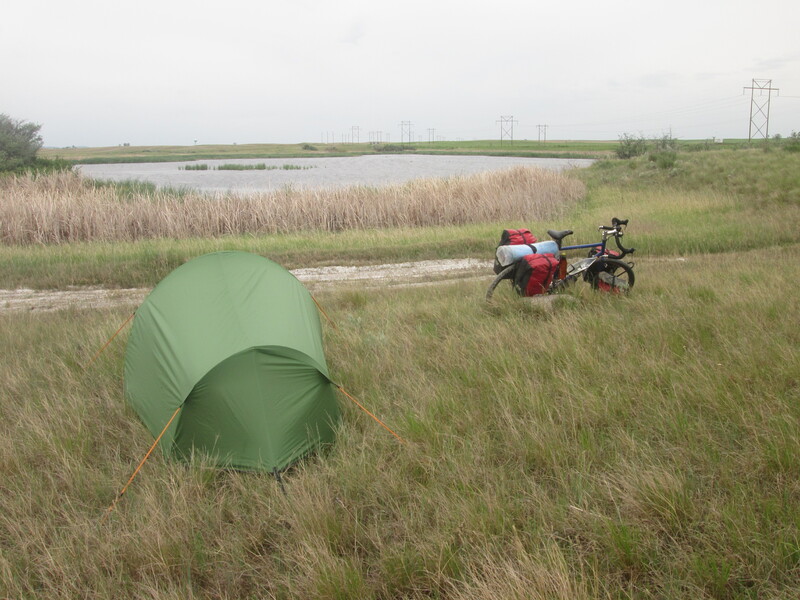 Just out of town was another Hike and Bike in the state park so I went and camped there. I am within striking distance of the Canadian Border. In the next 24 hours I will hopefully find myself in Canada. I will be heading directly north for a while, before heading over to pick up the Alaska High wayy. In the 80km cycle to Eureka there was nothing in between. It will be a lot like that now. 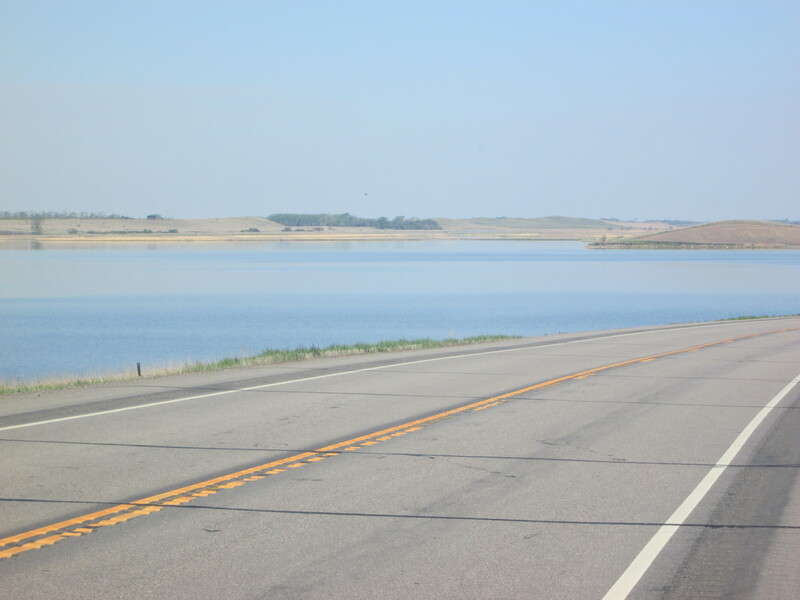 The highway 93 was flanked by forests on both sides and lots of lakes. Eureka is a nice town. I called into the free History museum in the park and had a good look around. In its heyday Eureka was a timber and mining town. I had another “Warm Showers” host tonight with Michelle and Greg. It was a full house with Michelle’s parents visiting and two other cyclists from Canada were staying as well. It was very good of them to host us. We all fitted in fine. Hi Adam! It was great to meet you yesterday. Hopefully you made it up to Logan Pass once they opened it up later in the day. We opted for a hike up to a viewpoint (Brown Mt) instead, but might try today. Enjoy your trip!! 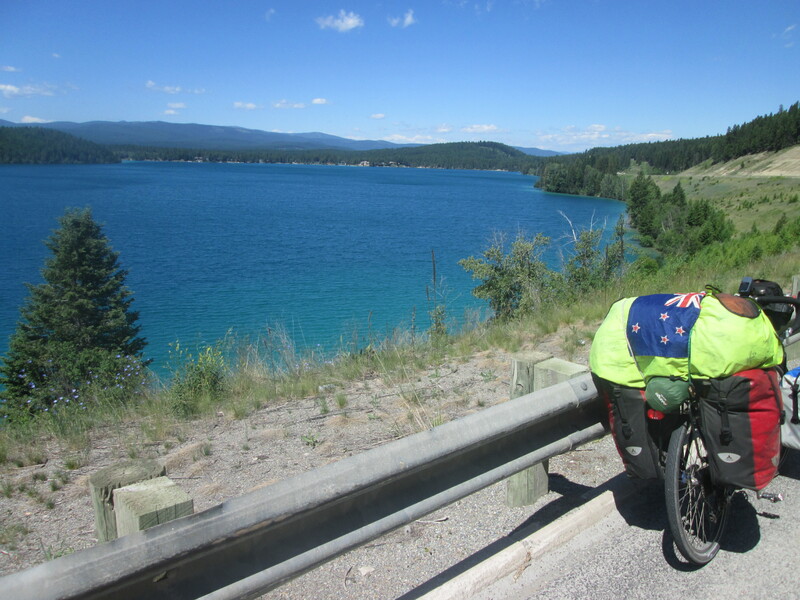 If you ever end up cycling through North Idaho or Colorado look us up on facebook, and we’d be happy to give you a hot meal, a soft bed, or ride with you over a pass.